Snowflake Bay is a Christmas book in the same way that Winter Wonderland is a Christmas song. It isn't one. Instead, it is a wintertime book that made me want to crawl up in front of a nice warm fire (and then douse the fire in order to turn on the Air Conditioning because I am not that kind of girl. No roaring fires for me). It features a sweet romance and a clumsy heroine with slight insecurities over her past. While the epilogue takes place on Christmas (at the heroine's sister's wedding), this book does not have the holiday feeling that I was expecting when I requested it from Netgalley. 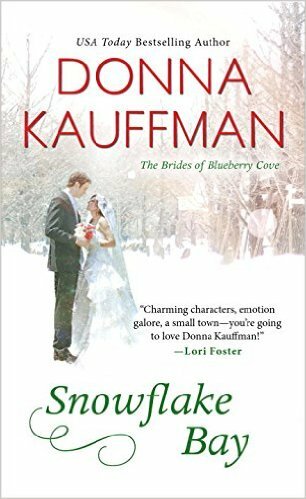 Fiona McRae has just moved home to Blueberry Cove, which is a part of Snowflake Bay, Maine, and she is helping her sister, Hannah, plan her Christmas wedding. She's also trying to get her interior design business up and running. She does not have time to let her old feelings for the boy that got away get in the way of her new life plans--even if said boy is now gorgeous and finally paying attention to her. Ben Campbell is only in town for the Christmas season, running his parents' Christmas Tree Farm now that they've retired to the Carolinas. He's also trying to run his agricultural design company, which happened to be based in Rhode Island. He definitely doesn't have time to notice his best friend's little sister or her Jessica Rabbit body. Besides, she's staying in Maine and he's not sure what he's doing once the season is over. This is the second Donna Kauffman book that I have ever read (the first being Sugar Rush, which I read last year on a plane from NY to California) and while I like these small town books, I have an issue with the anti-city vibe that I got from them both. Fiona more or less flees New York City to return to Blueberry Cove because the people there didn't appreciate her special brand of interior design and she didn't relish doing the types of classy home decor that her rich clientele preferred. To be honest, I didn't quite get Fi's artistic image, but then, I'm from New York City, so I guess I'm not supposed to get it. Oh, well. (In Sugar Rush, the main character also fled New York for the quiet shores of Georgia--possibly?) I get that the city is not for everyone, but I kept getting the feeling that Ms. Kauffman was putting down the people that thrive in a more urban environment. Fi was also very childish at times and the main conflict of the book surrounds the fact that the hero, Ben, calls her an unflattering nickname from when they were kids. He had no idea that she hated the nickname and was very upset with himself when he found out how she really felt about it. I thought this was a very juvenile plot point, but it kept popping up and keeping Ben and Fi from actually pursuing a relationship. There were times that I felt as if I was reading about a man and a sixteen year old girl because being inside Fi's thoughts were similar to being in my head when I was 16. I don't know many people who'd want to revisit their 16 year old self. I know I wouldn't. Ben was a much better character and I preferred being in his head. I really liked the way he dealt with his parents and the issues surrounding their move south. I also thought he was very sweet when he was with Fi. However, there weren't all that many scenes in which they actually interacted. A large part of the book took place before they got together and so chances were he was either dealing with his businesses or was with her brother. A part of me thinks that Ms. Kauffman relied on the fact that Ben and Fiona grew up together, so she wouldn't have to write all the getting to know you scenes. These characters hadn't seen each other in years and hadn't stayed in contact after they both left town, making her about 14 at the last time she was around him on an almost daily basis. Half her life was spent away from him, so you would think that there would be a lot of catching up to do, but we only got one scene of this. One scene in the entire book! Apparently, they were talking on the phone a lot throughout the book, but we weren't privy to these conversations. This made it feel as if the relationship was extremely rushed, so when he started talking about being in love with her and wanting to marry her, it felt too soon. All this probably makes you think that I did not like the book, but that isn't true. It was a cute read and I liked the relationship between Fiona and her sisters, Hannah and Kerry. Unfortunately, there wasn't enough of what I did like to counteract the parts that weren't as good. Snowflake Bay is available for pre-order and will be released on September 29th.